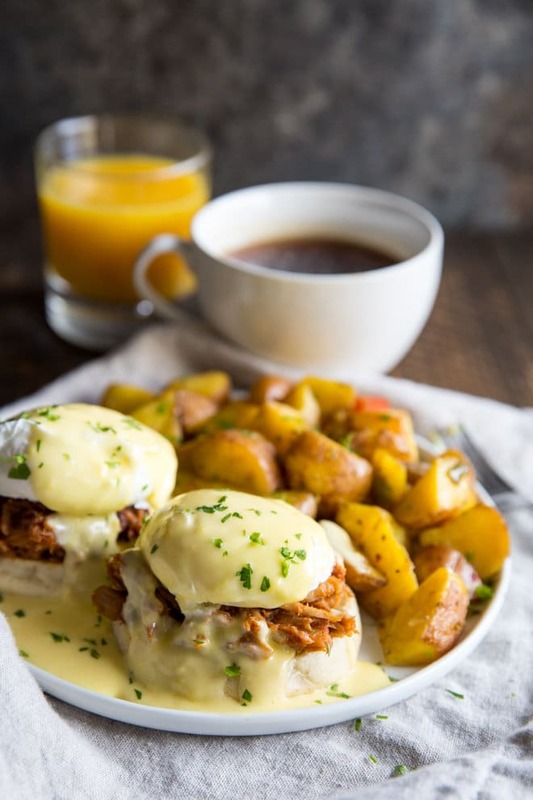 Pulled Pork Eggs Benedict is the ultimate breakfast experience. 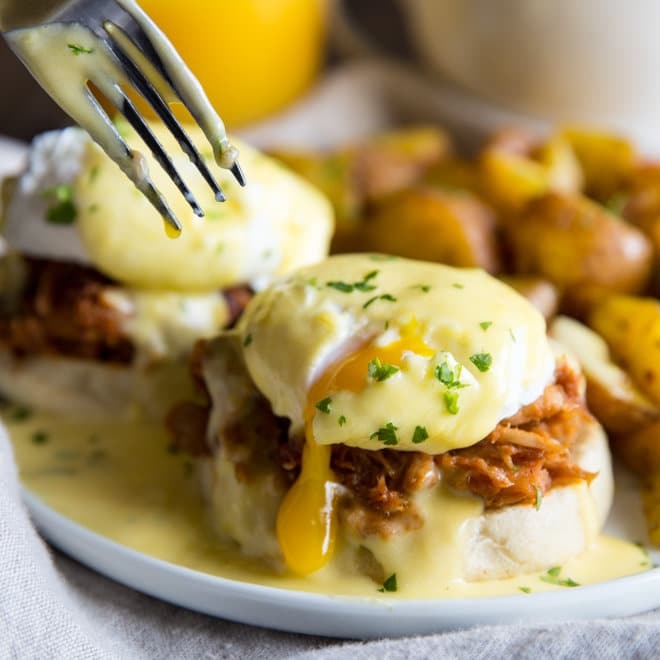 Barbecue pulled pork, English muffins, poached eggs, and plenty of Hollandaise! When I lie in bed at night and dream about food, Pulled Pork Eggs Benedict is right at the top of the dream pile. In case you think this is a quick-and-easy-breakfast-idea, by the way, you’re in the wrong place. P.P.E.B. is basically the opposite of quick and easy. How about labor-intensive? Time-consuming? And worth it? I’m pretty sure I’ve peaked. It’s all downhill from here on out, folks. So, obviously this a great way to put your leftover pulled pork to work. Have you tried my Magic Slow Cooker Pulled Pork? That’s what I’m using. 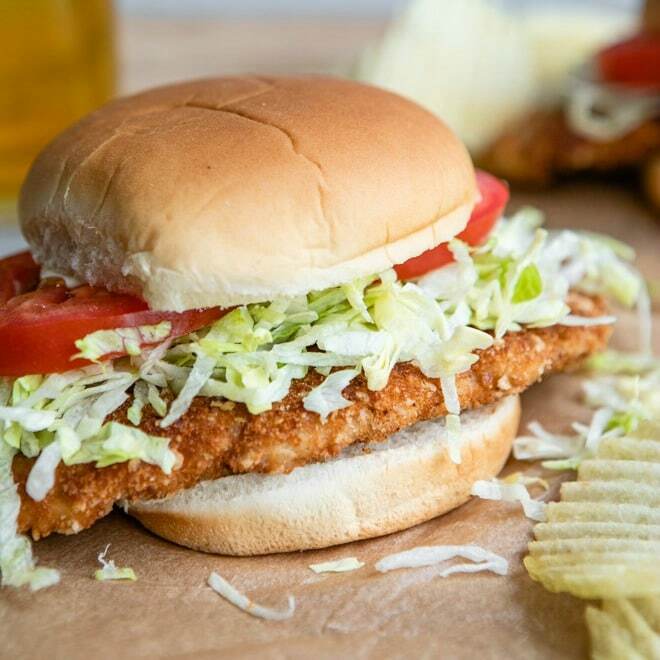 Extra Sweet Baby Ray’s, please. Except I’m making a batch of it just to make the P.P.E.B. Leftover, schmeftover. Next the poached eggs. I wrote out all the info in the instructions below, but let me just say this. Poaching eggs is no big deal. Making eggs over-easy is harder. So. Don’t walk away because of the eggs. If anything, walk away because of the Hollandaise Sauce. I’M JUST KIDDING. I literally just wrote a tutorial on Hollandaise Sauce yesterday. You’re covered. You’ve got this. You know what else you have? A crusty, buttery English muffin. A heap of barbecue pulled pork. A poached egg. AND HOLLANDAISE. It’s magical, it’s glorious, it’s the stuff dreams are made of. My dreams. I hope you love it as much as I do! 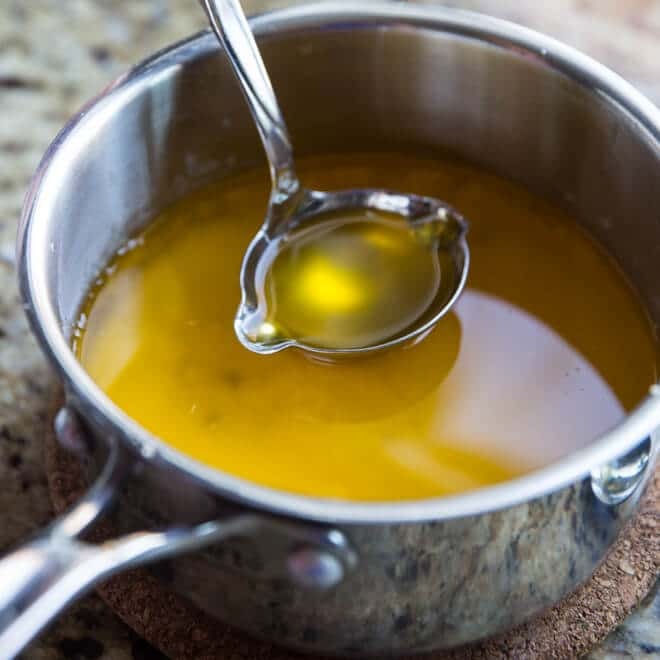 Set a glass or metal bowl over a pot of gently simmering water to make a double boiler (do not let the water touch the bowl). Add egg yolks to the bowl. Using a metal whisk or wire whip, whisk the yolks constantly without overcooking the yolks. You'll know the yolks have thickened enough when you can draw a line through the yolks and yolks stay put. The line does not fill in. Remove from heat and immediately stir in lemon juice. Off the heat, set a kitchen towel over pot of water and set bowl on top. Starting with just a few drops at a time, whisk in the warmed clarified butter. Once the emulsion has formed, you can add butter more quickly. Once all the butter has been added, taste for seasonings. Add salt and tabasco or cayenne pepper if desired. 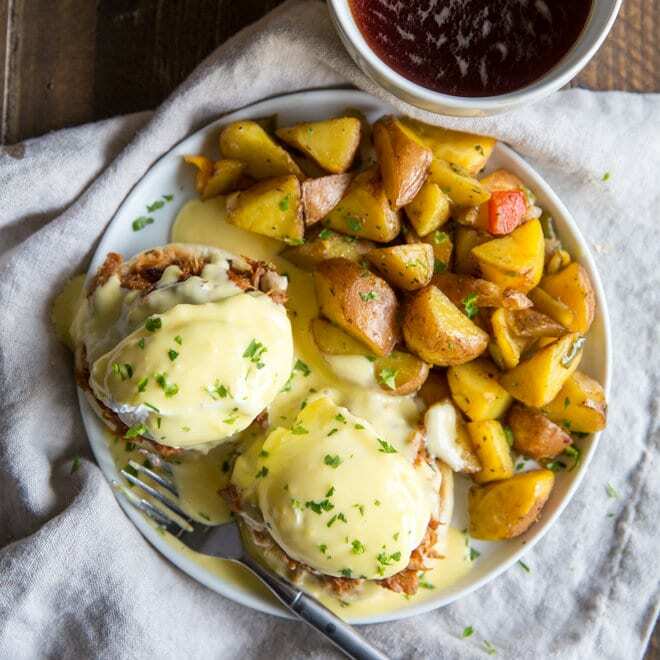 Set aside in a warm (but not hot) place until you are ready to assemble the Eggs Benedict. If the sauce appears too thick, whisk in a few drops of warm water until desired consistency is reached. Fill a 3-quart saucepan half full with water. Add vinegar and bring to a simmer, about 200 degrees. Hold this temperature. Crack 2 eggs into two separate ramekins, small bowls, or tea cups. Carefully slide each cracked egg into the simmering water. Poach as desired, about 3 to 5 minutes. Using a slotted spoon, carefully remove each egg. Using a paring knife or kitchen scissors, trim any jagged edges if desired. Arrange 2 halves of an English muffin on a plate. Top each muffin half with 1/4 cup pulled pork. Carefully lay a poached egg on each pile of pulled pork. 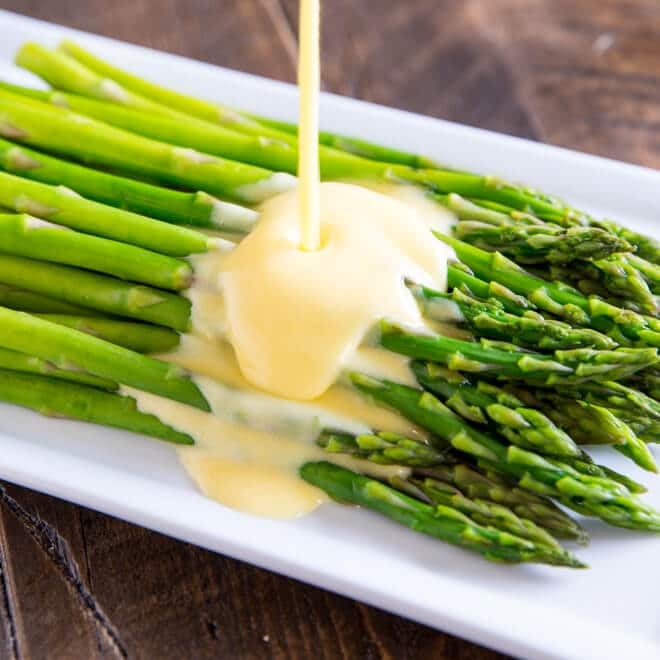 Drizzle with hollandaise sauce. Garnish with parsley if desired. 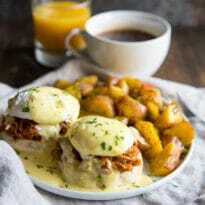 Repeat with remaining English muffins, pulled pork, and eggs, and Hollandaise Sauce. Serve immediately. I love how you mention lying awake dreaming about food! I do that! I do that! But this really is the stuff (food) dreams are made of. 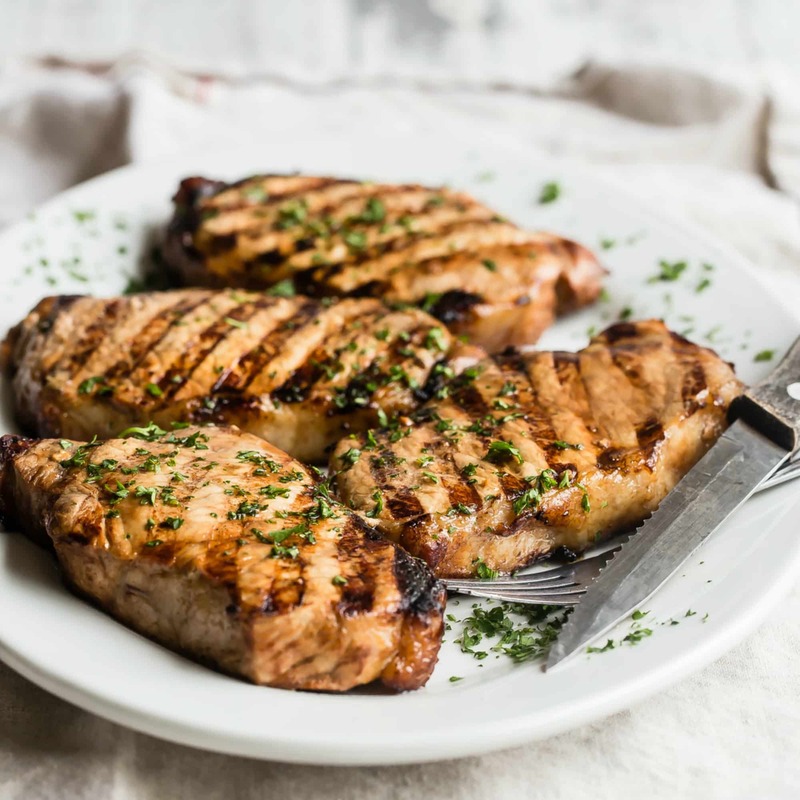 This reminds me of something you’d get served on that show on the food network ‘Diners, Drive-ins and Dives’ (or something like that). They always have slow-cooked stuff with mountains of other delicious ‘stuff’ added. Can you set the breakfast table for one more next weekend, please? The nutrition info says that this has 94 carbs per serving? Is that a misprint? 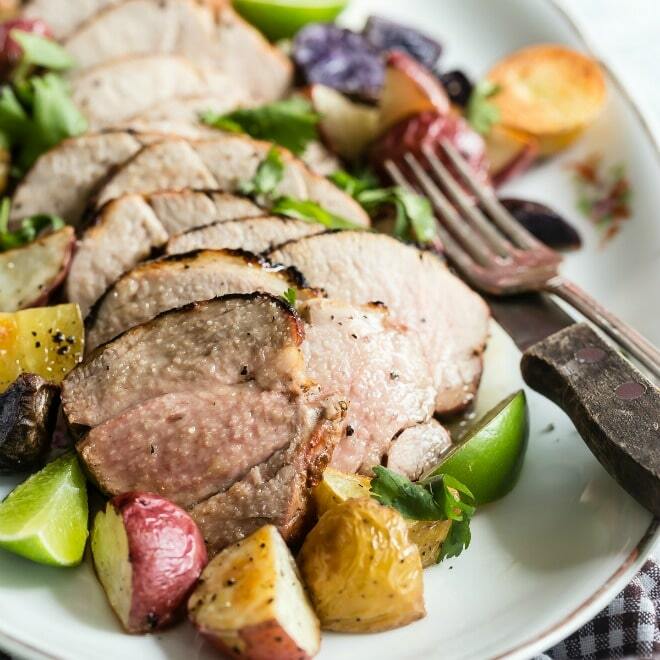 The pulled pork recipe only has about 20 carbs per serving. The only other ‘carby’ thing is the English muffin and one of those is about 25 carbs. My T1 diabetic husband had this in a restaurant and it did not spike his blood sugar so I thought that I’d love to make it. But he could never handle 94 carbs.